Bolster courage to face whatever's ahead, give one as a show of support, a subtle reminder of gratitude or a poignant memento. Bracelet features chunky rose quartz beads hand knotted onto pink cord with an 8-12" cinched drawstring close and sterling silver ribbon accent. Ring features a large (3/4") faceted Rose Quartz bead bezel set in sterling silver with a subtle ribbon accent. Band measures 3/4" in front and gently tapers to the back for comfort. Whole sizes 6-10. 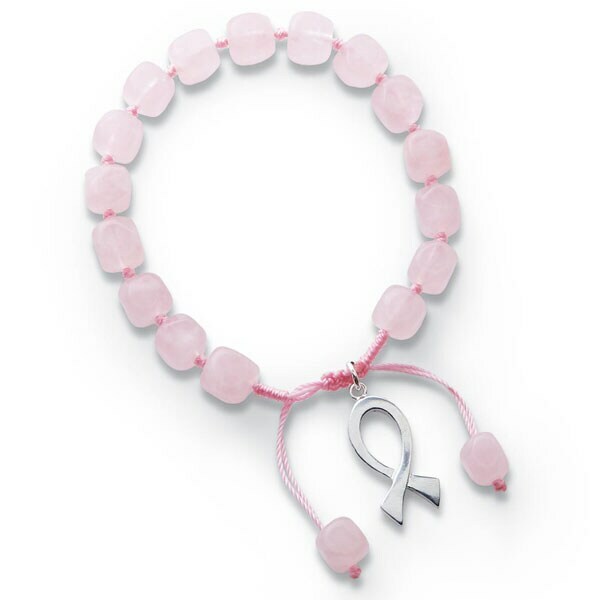 A portion of the proceeds goes to support breast cancer research.